Que the annoying guy with the bullhorn..."The renovation starts now!" You have to watch Extreme Makeover Home Edition to get that one. 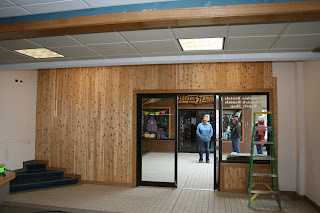 The rental shop is undergoing a transformation to become Trader Cafe for the summer. This is the newest edition to our summer services. Trader Cafe will be open Fridays-Sundays and offer coffee, soft drinks, sandwiches, wraps, and snacks. Make sure you stop by and check it out this summer!